While Armed Forces Reunions plans reunions for all branches of the military, we here salute fantastic Army reunions from 2015. In reunion planning, as in real estate, it’s all about location, location, location! Choosing a site that has historical or emotional significance can be the difference between a good reunion and a terrific reunion. New Orleans, with the WWII Museum, is a magnet for reunions of all branches, and this year we hosted the Timberwolves (104th Inf), 7th Infantry Regiment, and the 517th Parachute Regimental Combat Team there. The All Birddog Unit Reunion returned to Dothan, AL and Fort Rucker, home of Army Aviation, to dedicate their own memorial adjacent to the U.S. Army Aviation Museum. A BBQ at the Friends of Aviation hangar with helicopter and Birddog flights for attendees were the highlight of the reunion. The Army Otter Caribou Assn. toured another of the nation’s great museums – the National Museum of the Air Force in Dayton, while the 106th Infantry Div. toured historic Charleston and the Patriots Point Naval and Maritime Museum. Some cities are natural destinations for certain branches of the military. While Norfolk is rightly associated with Navy reunions, this year we planned reunions for the 94th Infantry Division, 4/9 Infantry Manchu (Vietnam) Assn., and the Americal Division in our hometown of Norfolk. The Americal veterans had a moving memorial service at the Gen. Douglas MacArthur Memorial and toured the U.S. Army Transportation Museum at Fort Eustis. The Manchus had a harbor lunch cruise, toured the world’s largest naval base, and paid tribute to one of their own – conducting a graveside memorial service for Hampton native and posthumous Medal of Honor recipient Ruppert Sargent. In this month’s Veteran Interview meet Larry Swank with the Americal Division. This was AFR’s first year working with Americal and we look forward to planning many more reunions with them in the years to come. Our Featured Destination is Norfolk, Virginia. Norfolk and her sister cities host more military bases than anywhere else in the nation, making Norfolk a Top Reunion Destination for any branch of the service. Cruise the Elizabeth River harbor on a Tall Ship or lunch/dinner cruise or watch world-renowned artists blow glass at the Chrysler Museum Glass Studio. If history is your thing, sign up for a boat or land tour of the world’s largest Naval Base, stop by Fort Norfolk, or walk the Cannonball Trail. Navy buffs can engage in lively tours of Naval Station Norfolk, the world’s largest naval station and home to more than 100 ships in the Atlantic Fleet. Norfolk is also home to Battleship Wisconsin, one of the largest battleships in the world. Stop by The MacArthur Memorial, a museum and research center dedicated to preserving and presenting the story of the life of General of the Army Douglas MacArthur. Or take a stroll along the waterfront and stop by the Armed Force Memorial, located Town Point Park. This beautiful memorial is dedicated to veterans of American conflicts from the Revolutionary to Persian Gulf War. Within the memorial are twenty inscriptions of letters written home by U.S. service people who lost their lives in battle. The Virginia International Tattoo is an exhibition of marching bands, massed pipes and drums, drill teams, gymnasts, Scottish dancers, choirs and more. It is the largest show of its kind in the United States and includes all US military branches plus the branches of eight to ten other counties. Located within a day’s driving distance from two-thirds of the U.S. population, Norfolk is accessible from most major cities on the East Coast. Nearby Norfolk International Airport offers hundreds of flights daily. A massive surprise attack, the launch of the Tet offensive saw wave after wave of more than 80,000 North Vietnamese soldiers and Viet Cong roll into South Vietnam. Starting January 30, 1968, enemy troops penetrated deep into the country and toward the vital air base in Da Nang, controlled by U.S., South Vietnamese and allied forces. Army Lt. Larry Swank was a forward observer in a field artillery unit of the Americal Division. Swank was in company A, 1st Battalion, 6th Infantry, 198th Light Infantry Brigade of the division. He served in the command group directing the firepower of 105 mm howitzers and other artillery to support the infantry. Swank received a Silver Star for his role in defending the air base. The Americal Division was formed in Caledonia, Solomon Islands during World War II, the only named division in the army at the time, also called the 23rd Infantry Division. The group saw brutal conflict at Guadalcanal in October, 1942, the first Army infantry to engage the enemy in World War II and awarded the Presidential Unit Citation (Navy), along with the Philippines Presidential Unit Citation. The Americal was stationed around the globe during the Cold War, and was the largest division in Vietnam. Its soldiers received scores of medals and recognition, including platoon sergeant Fennis D. McCleery being awarded the Medal of Honor for actions in Quang Tin province in May, 1968. Because of all the conflict the division saw between 1967 -’71, the group is also referred to as the Gunfighters. “To say the Americal saw its share of combat and bravery would be an understatement, especially for those four years in Nam,” Swank said. 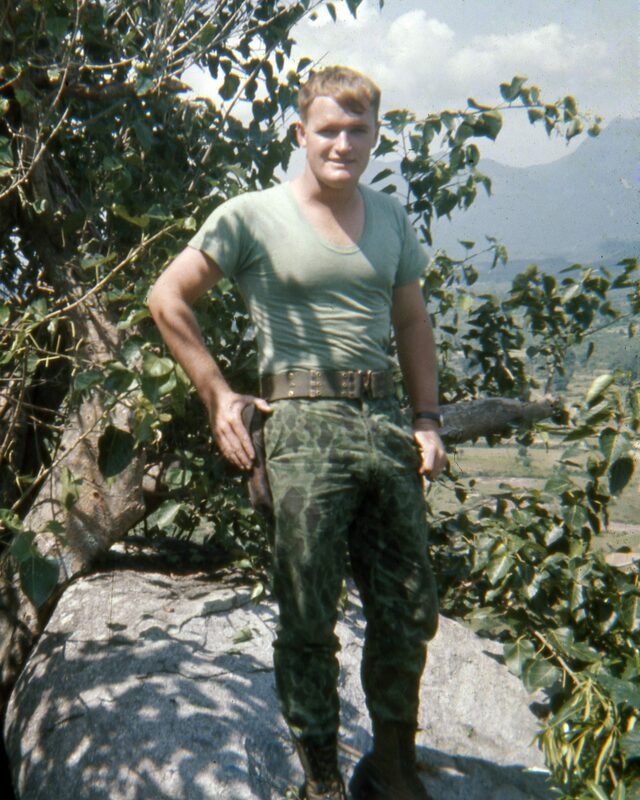 Serving until 1969, Swank returned to the states, graduated from the University of MD and entered the Army Reserves. He returned to active duty and worked at the Pentagon overseeing Army commissioning programs before retiring as a Lt. Colonel in 1992. He went on to a successful career in the IT industry as Director of Software Deployment for Falls Church, VA-based Computer Sciences Corporation. Swank again served the Americal Division when he joined the group’s veterans association 11 years ago and helped create the website for his infantry company, http://www.a-1-6.org. He was the group’s National Commander and today is Chairman of its Executive Council. The association has more than 3,000 veterans from World War II, the Cold War and Vietnam, holding annual reunions across the country. Their most recent gathering in October in Norfolk, VA was managed by Armed Forces Reunions, Inc., parent company of BookMyReunion.com.